What do the senior pictures of a Chugiak High School class of 2016 senior have to do with a Latvian born American photographer, a Spanish surrealist painter, and a 67 year old photo session? Plenty! 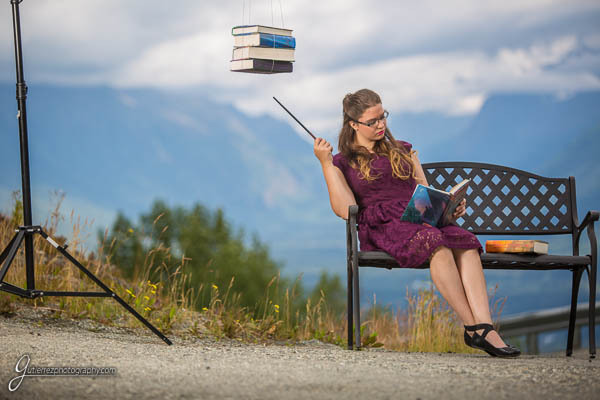 When discussing her senior portraits earlier this summer, Gabby told us she’s a huge Harry Potter fan. 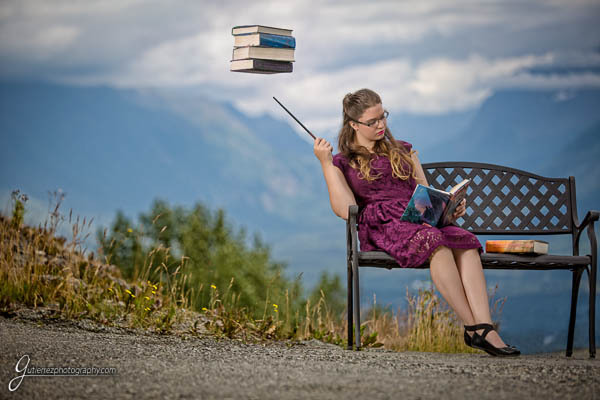 For her concept session she had the idea of levitating a stack of books while she read. We loved the idea. Game On! Gabby provided the wand and the books. Now we had to figure out how to levitate them. 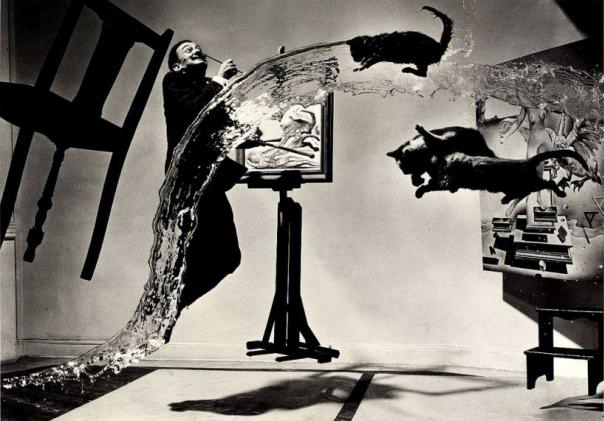 For guidance we turned to a 1948 Philppe Halsman session with surrealist painter Salvador Dali. The two met in 1941 and found inspiration in each other’s work. Between the years 1948 and 1985 they collaborated in creating a number of unusual and intriguing photographs. The first, and perhaps most famous, was Dali Atomicus. This is the image as originally published in 1948. So, how did Halsman create this image without Photoshop? Part was staging, part was a kind of choreography, and part was darkroom trickery. That’s right, he cheated after the fact! Although this comes as a huge shock to many folks, photographers have been manipulating images after the fact almost since the beginning in the 1830’s. The image below is the unretouched photograph Halsman shot. In fact, he took 28 exposures that day before he got what he wanted. Staging. Halsman suspended both picture frames by wires from the ceiling. The foot stool was set on a small block to lift it off the floor. The floating chair was held in place by a not-quite-off-the-frame assistant. Choreography. Three things happened simultaneously on Halsman’s count. 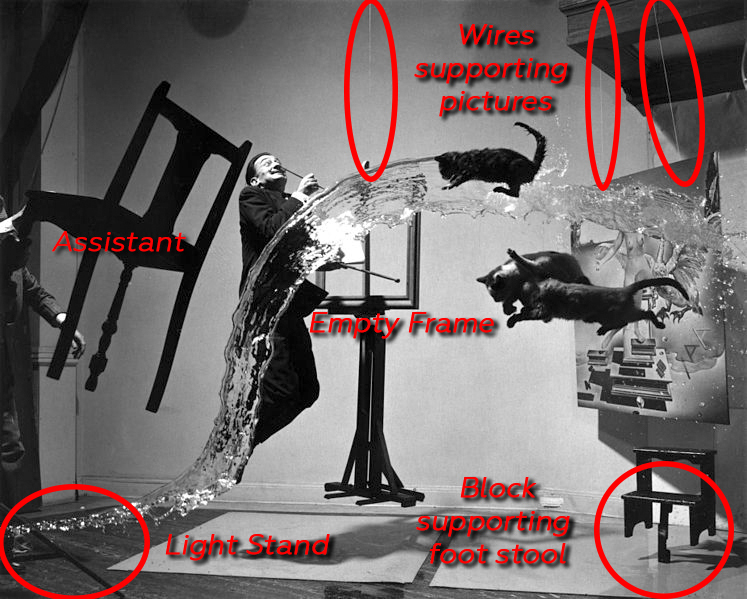 Dali would jump into the air and strike his pose, an assistant would throw a bucket of water into the frame, and several assistants would throw three or four cats in front of the camera. Halsman would then go into the darkroom and develop the film to see if he’d captured what he wanted. Meanwhile, his assistants would mop the floor and round up the cats. They did this 28 times. I’m guessing the cats were unimpressed and not too happy about any of this. Darkroom trickery. Once he had the image he wanted, the serious darkroom work began. 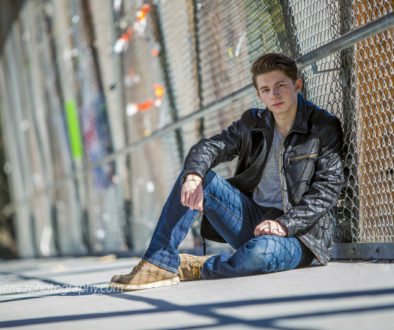 The image was cropped to remove most of the assistant holding the chair and part of the light stand on the left side. Part of the light stand, the assistant’s hand, the block supporting the stool, and the wires supporting the frames were all removed in the darkroom. 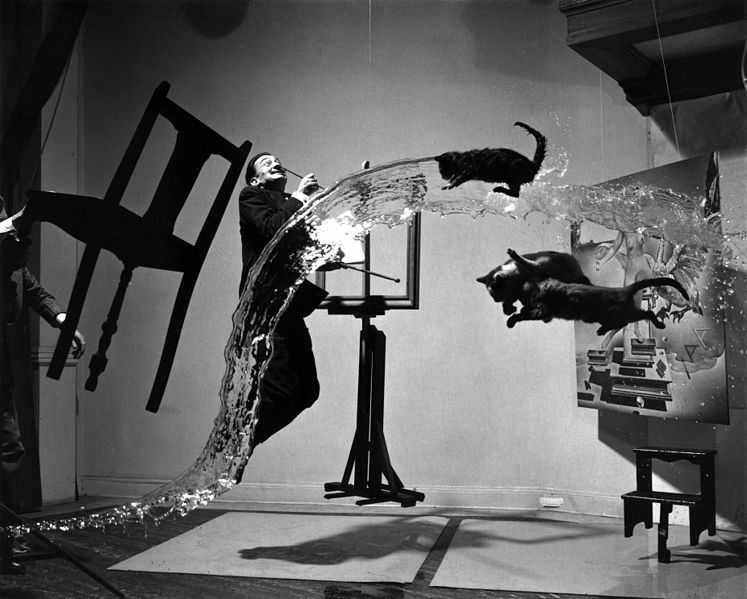 The painting in the frame closest to Dali was added in the darkroom process. Our shoot used Halmans’s approach but didn’t include heaving any cats around. 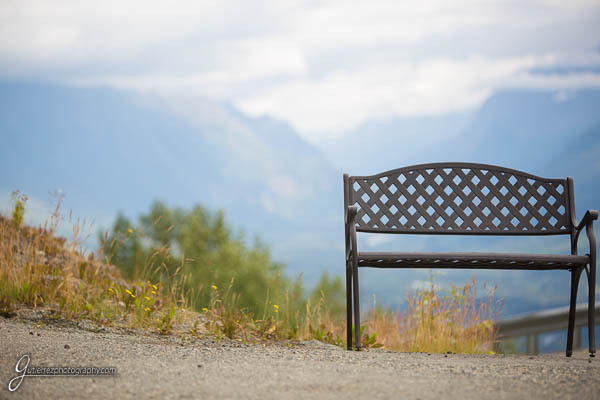 The photograph below shows Gabby sitting on the bench. We suspended the books in the air from wires attached to a boom arm on one of our light stands. After we shot the pose we liked, we moved the light stand and books from the scene and took this empty shot. We used this in Photoshop to remove the light stand and most of the wires. This is the full image before cropping and with some adjustments applied. You Guys are the most creative photographers in town, I love this line of thinking when coming up with shoot Ideas.